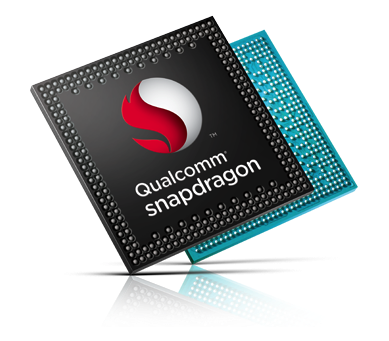 The Qualcomm Snapdragon 210 MSM8909 is an entry level SoC for Android based tablets and smartphones. It contains four ARM Cortex-A7 CPU cores (quad core) with a clock rate of up to 1.1 GHz, an Adreno 304 graphics card, an LPDDR2/LPDDR3 memory controller (max. 533 MHz), a eMMC 4.5 port, and a LTE Cat 4 radio module. The performance of the Cortex-A7 cores is rather low and positioned in the entry level of 2015. In our tests of the CAT S40 smartphone, daily tasks and browsing however imposed no problem for the SoC. The integrated Adreno 304 graphics card is clocked at 400 MHz and also positioned in the entry level. Therefore, demanding games may not run smoothly in high settings. The integrated video engine allows the encoding and decoding of 1080p H.264 videos and decoding of H.265 videos. The main display can be driven with up to 1280x720 Pixels. The SoC integrates Bluetooth 4.1 + BLE, 802.11n (2.4 GHz) WiFi, and a Cat 4 4G-LTE-Modem (LTE FDD, LTE TDD, WCDMA (DC-HSDPA, HSUPA), CDMA1x, EV-DO Rev. B, TD-SCDMA and GSM/EDGE) with a max. speed of 150 Mbps. The SoC is manufactured in a 28 nm LP process (at TSMC most likely). Due to the low energy consumption of the SoC it is also suited for small smartphones.